There is a tendency among right-wing think tanks in the United States involved in Middle East policy to employ “experts” from the region to bolster their pro-war advocacy campaigns. One of the more infamous cases is that of Ahmad Chalabi, the darling of the neocon crowd during the lead up to the invasion of Iraq who, after his return to Iraq, leveraged his wealth and connections to become a major political figure there, often to the embarrassment of his erstwhile comrades. More recently, there has emerged a cadre of high-profile individuals from the Greater Middle East who, unlike Chalabi, have turned against Islam and embraced their lives in the West. In doing so, they have adopted views strikingly similar to some of the more hawkish factions in U.S. politics. Notable examples include Ayaan Hirsi Ali, Wafa Sultan, and Nonie Darwish, all known for their vociferous condemnations of Islam, their affiliations with prominent neoconservative organizations, and the anger they have aroused from both Arabs and Muslims worldwide. Though the research and analysis produced by these self-styled “apostates of Islam” often has limited scholarly value, they have played an important role in providing a purportedly moral justification for Western military campaigns in Muslim countries. These apostates also frequently adopt a certain presumptuous arrogance in their statements about Islam and its adherents that non-Muslim westerners would likely find difficult to pull off. Hirsi Ali, for example, has spoken repeatedly of “the tragedy of the tribal Muslim man” who has fallen prey to “the grip of jihad,” claiming that “the only difference between my relatives and me is that I opened my mind.” Sultan has claimed that the Crusades were simply the logical reaction to “Islamic religious teachings.” And Darwish has frequently spoken of the “culture of death” in the Middle East. The hawkish right in the United States has heavily promoted the writings of these women, who have subsequently joined the ranks of neoconservative organizations like the American Enterprise Institute, the Center for Security Policy, and the Middle East Media Research Institute. Unsurprisingly, these groups share many of the views of their new pundits: an unapologetic defense of all things “western,” a perceived moral duty to protect the civilized West against Islam, and a willingness to use all means necessary to achieve this objective. Commenting on this pattern, Salon.com’s Glenn Greenwald has pointed out that those keenest to “help” the oppressed people of the Middle East are also those most eager to bomb countries in the region. These apostate Muslims and their neocon colleagues have developed tight, symbiotic relationships. Rightwing institutions provide platforms and legitimacy, allowing otherwise little known individuals to rise to positions of international prominence. None of these so-called experts have produced serious scholarship or careful analysis of actual political effects, aside from personal or anecdotal experience. And their main value, at least in terms of political discourse in the United States, appears to be that, as former insiders, they can provide a sheen of legitimacy to the Islamophobic tendencies of their rightwing supporters. Comments like these are given more weight because of the identities of the sources. By vilifying the aspirations of the societies they’ve left behind, their discourse takes on an air of “truth to power,” safe from charges of neo-colonialism or western exceptionalism. Their hyperbolic pronouncements have consistently been used to buttress conservative arguments for war by creating a pretense that “people from the region” support such actions. Publications advocating tougher, more aggressive policies in the “war on terror” often rely on narratives provided by these figures, in ways reminiscent of Chalabi’s “intelligence” on Saddam Hussein’s Iraq and Amir Abbas Fakhravar’s claims of impending Iranian collapse. There is a certain paradox in the effort to rely on indigenous opinions to justify policies, while ignoring the overwhelming condemnation of such perspectives by the vast majority of the indigenous people themselves. And yet, these figures are repeatedly held up to mirror and confirm the predetermined opinions of war-hungry organizations eager to validate their destructive agendas. Early this year, David Frum, a speechwriter for President George W. Bush who famously coined the “Axis of Evil” phrase, hosted a posh gathering in northwest Washington D.C. to honor Ayaan Hirsi Ali for her “strength,” “courage,” and “intelligence.” Though attendees were limited for “security reasons,” Hirsi Ali was surrounded by fellow neocons, discussing topics from the “liberation of Iran” to the “religious extremism” behind the Gaza flotilla. The respect afforded by militarist ideologues to Hirsi Ali and her compatriots is palpable, based almost solely on the ability of these figures to validate simplistic perceptions of the Muslim world as violent, backward, and dangerous. Just as diehard Cold Warriors viewed all socialist countries as a single, threatening entity, these apostates and their rightwing supporters have reified the Islamic world into an undifferentiated mass. They conveniently lump the disparate strains of Islam, the competing visions of Muslim identity, and the blurred and fluid boundaries of the Middle East, into a single—and threatening—unit. But in reality, the “Muslim world,” if such an entity can be said to exist, would encompass not only the Deobandis of Pakistan and the Wahhabis of the Gulf, but also Sufi mystics in Konya, Druzes in Lebanon, Shafi’i in Indonesia, and countless others. Additionally, this monolithic view leaves little room for positive developments, such as the creation of democratic institutions in 23 Muslim countries. And it seems to have blinded these apostates to the injustices that have resulted from U.S. military interventions. This view also fails to account for the many actors and organizations throughout the Greater Middle East who may disagree with Western policies for reasons not derived from religion or culture, such as the secular PFLP in Palestine or the Free Patriotic Movement in Lebanon. Indeed, the very existence of icons such as Ayaan Hirsi Ali, Wafa Sultan, and Nonie Darwish falsifies to a great extent the notion of a monolithic Muslim world. Their ability to react and rebel against their environment, as well as the variety of Muslim responses to their work, demonstrate the diversity of thought and opinion within Muslim society. Portraying Muslims in a simplistic and negative light may be a useful tool to build popular support for military campaigns. But in the long term, ignorance and stereotyping will only serve to undermine any policy objectives in the region. A more thoughtful foreign policy would be one that is grounded in dialogue, interaction, and the drive for understanding—not demonizing and finger-pointing. The sooner the U.S. public confronts this reality, the sooner peace can be achieved in the Middle East. American Enterprise Institute, “Scholars & Fellows, Ayaan Hirsi Ali”, American Enterprise Institute, http://www.aei.org/scholar/117. 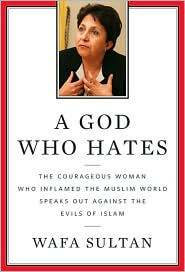 Wafa Sultan, A God Who Hates: The Courageous Woman Who Inflamed the Muslim World Speaks Out Against the Evils of Islam, New York: St. Martin’s Press, 2009. James Langton, “Life as an Infidel,” The Guardian, May 13, 2007, http://www.guardian.co.uk/world/2007/may/13/islam.religion. Asra Q. Nomani, “Wafa Sultan,” Time, http://www.time.com/time/magazine/article/0,9171,1187385,00.html. Ayaan Hirsi Ali, “Nomad: From Islam to America: A Personal Journey Through the Clash of Civilizations,” New York: Free Press, 2010, p. 79. Nonie Darwish, “Now they call me infidel: why I rejected the jihad for America, Israel, and the war on terror,” London: Sentinal, 2006, p. 197. Pankaj Mishra, “Islamism: How should Western intellectuals respond to Muslim scholars?” The New Yorker, June 7, 2010, http://www.newyorker.com/arts/critics/atlarge/2010/06/07/100607crat_atlarge_mishra. Hesham Hassaballa, “A Lost Opportunity,” AltMuslim, March 13, 2006, http://www.altmuslim.com/a/a/a/2329; Jim Holstun, “Nonie Darwish and the al-Bureij massacre,” Electronic Intifada, June 26, 2008, http://electronicintifada.net/v2/article9646.shtml. Glenn Greenwald, “John McCain on the Evil, Barbaric Iranians,” Salon.com, June 12, 2010, http://www.salon.com/news/opinion/glenn_greenwald/2010/06/12/mccain/index.html. Quoted from the website of the Committee on the Present Danger, “M. Zuhdi Jasser, MD.,” http://www.committeeonthepresentdanger.org/index.php?option=com_cpdteam&id=1621&Itemid=89. Ayaan Hirsi Ali, “How to Win the Clash of Civilizations,” Wall Street Journal, August 18, 2010, http://www.aei.org/article/102433. Ayaan Hirsi Ali, “Cut and Run Won’t Do,” The Australian, November 4, 2008, http://www.aei.org/article/28883. Renee Taylor, “Exclusive: Cruel and Usual Punishment: The Terrifying Global Implications of Islamic Law,” Family Security Matters, http://www.familysecuritymatters.org/publications/id.2207/pub_detail.asp. Garibaldi, “Wafa Sultan is Better Known as Wafa Stalin,” Loonwatch.com, December 2, 2009, http://www.loonwatch.com/2009/12/wafa-sultan-is-better-known-as-wafa-stalin-sultan. Laura Rozen, “Iran Hawks Reorganize,” The American Prospect, November 13, 2006, http://www.prospect.org/cs/articles?articleId=12209. Pamela Paul, “The Party, in Exile,” New York Times, June 13, 2006,http://www.nytimes.com/2010/06/13/fashion/13Party.html. Pamela Paul, “The Party, in Exile,” New York Times, June 13, 2006, http://www.nytimes.com/2010/06/13/fashion/13Party.html. Philip N. Howard, Digital Origins of Dictatorship and Democracy, New York: Oxford University Press, Inc. (2010). The Economist, “A Critic of Islam: Dark Secrets,” The Economist, February 8, 2007, http://www.economist.com/node/8663231. M. Junaid Levesque-Alam, “Robert Wright and the Koran: Grappling with the Wrong Religion,” Foreign Policy in Focus, September 15, 2010, http://www.fpif.org/blog/robert_wright_and_the_koran_grappling_with_the_wrong_religion.